We Can Do No Great Things, Only Small Things With Love. There are many ways to support Inanna House and raise Lyme Disease Awareness. Every action counts, big or small. A board to share your Love, Hope, Healing and Lyme ideas, stories, and images. What would you do if you were healed? What has helped you heal? What inspires you to heal? We want to know it all! Time for Love, Hope, and Healing for everyone! Would you like to help build the LOVE. HOPE. HEALING. LYME Pinterest Board to raise awareness and share inspiration with those who need it? Click The Image To Sign-Up! Join us! Simply click on the photo above and follow the Pinterest Board (you will get a follow back from us too!). Comment on the title photo to let us know you would like to be added. Give us a minute (or two, or three, basically we will add you as soon as possible) and VIOLA! You can now start pinning your ideas, stories and inspirations. Don't Forget To Be Social! And don't forget the power of social media! 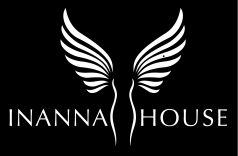 Use the links on the right to easily share and tweet about Inanna House. Just click on the icons and you will help spread the word on Twitter and Facebook. The more awareness, the better! Become a part of Inanna House. Join our mailing list for the latest news and upcoming events! We promise that your information will be protected and you will only receive relevant content.